:-) really funny! may the force be with you in the serps! the dark lord has had his days, its time for the rebelion to overcome to goodness with properly done internet searches. hilarious cartoon, kudos to the cartoonist. Thanks for the laugh! That was great. Very cool find! This guy is OBVIOUSLY a Trekkie of the worse kind. 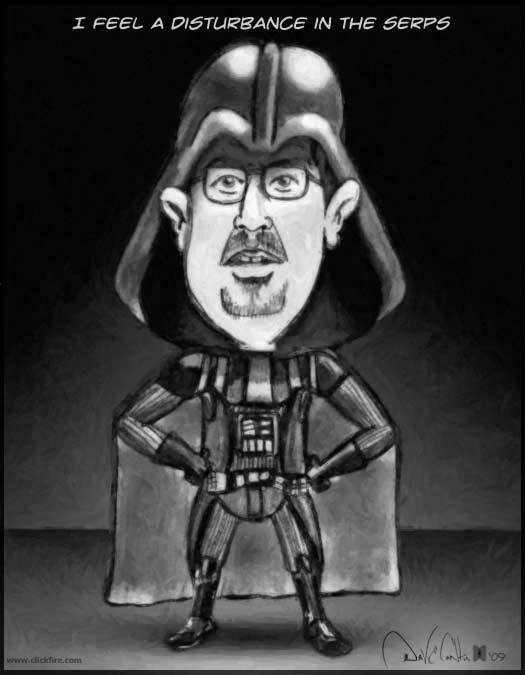 Actually, I’m part-Trekkie myself, so I can’t blame the guy for illustrating himself as Darth. My the force be with you!! I am picturing this character mixed in with Space Ball’s Rick Moranis’ Darth Vader. If you have his image stuck in your head, being held back in a fight as well, then it really adds to the humor here. I’m really enjoying these comics as well! They have been forcing me to hit up Google for answers as to what the internet lingo means. It sort of kills the joke if you need to look it up, but I can still find the humor after the fact. And heck, I am learning something in during the process. Ha ha ha, excellent, what an idea……..